RALLY TO COMPEL GOVERNOR JERRY BROWN To protect our children and ban the use of CA EPA OEHHA Prop 65 Listed Chemical, Glyphosate (Roundup) on California‘s K-12 public schools and adjacent recreation areas as well as in child day care centers and public parks throughout the State of California. Glyphosate is a patented antibiotic, a genotoxin, neurotoxin, endocrine disruptor, herbicide – key ingredient in Roundup, the most heavily used pesticide on Earth. Glyphosate is now found in food, water, soil, human blood, urine, breastmilk and sprayed on 250 crops…it does not wash off. Glyphosate is banned in many nations. 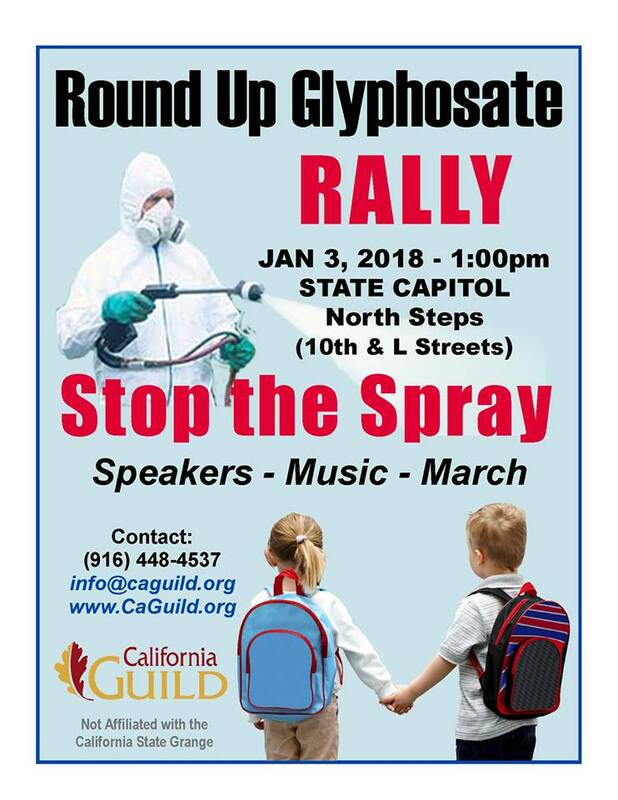 Stand and RALLY with The California Guild to Stop The Sprays! Dr. Michelle Perro, Pediatrician, Author What’s Making Our Children Sick? No Comments to "“Stop the Spray!” Rally – Round Up Glyphosate"